Have you guys ever heard of Windows Powered? It's an operating system that's like Windows 2000. 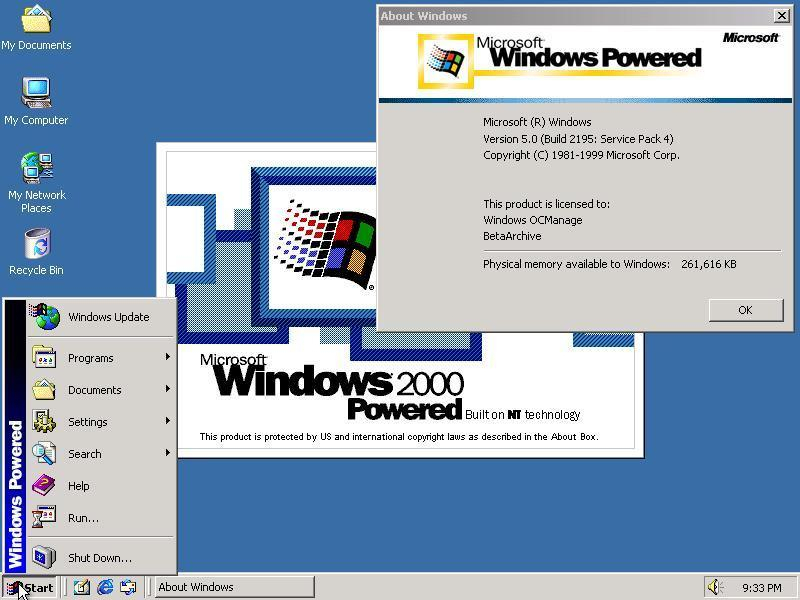 But Windows Powered is, well, it's kind of hard to explain what this is, because I couldn't find a lot of juicy details about this OS, but I think they say that it's like an "embedded" version of Windows 2000. It's probably for things like payphones (anything that can use an embedded operating system), and high-end computers. So anyway, I'm just offering this because I found it somewhere on the inter web. I actually have an ISO image for Windows Powered on my Google Drive, but I can't show you the ISO because the file size is too large. Supposedly there was an add-on for Windows 2000 Advanced Server used with NAS systems by that name, but no genuine media has ever turned up. And it is not much of an "offer" without media. It's a very good fake at that. So many people think it's real that its "startup sound" has popped up in many Windows startup sound compilations. There's even a thread over on BA about this (from a while ago). 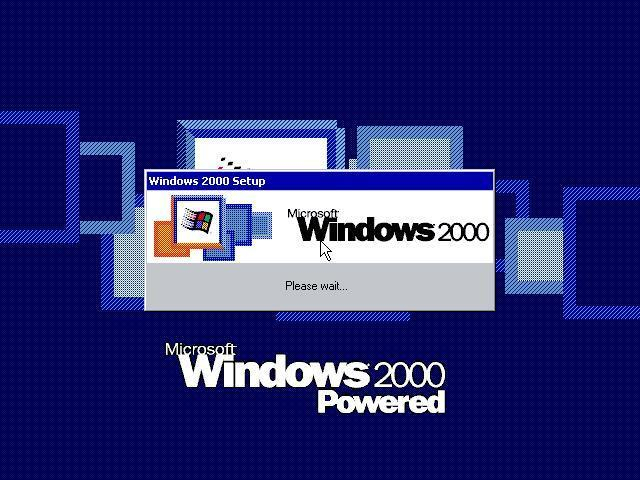 Yeah, I think I have been seeing some people saying that Windows Powered is considered a "fake Windows 2000". I actually discovered this OS from YouTube videos with all of the Windows startup and shutdown sounds. There are also a couple video tutorials on YouTube on installing Windows Powered in VirtualBox and other hypervisors. That's how I got the ISO for this operating system, from the users who made those tutorials. But I have to tell you, it does seem kind of fake. There are these payphones (although not where I live-- I saw one on vacation in Europe a few years ago) that have a screen and can place VoIP calls and the like. 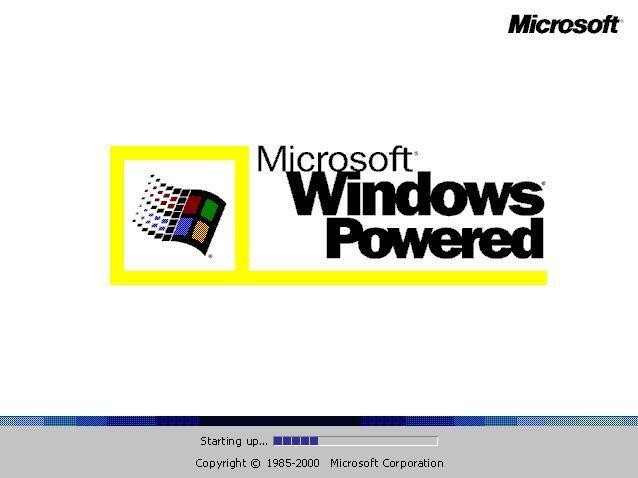 They probably run Windows CE, not "Windows Powered" however. This is actually from someone who made a video tutorial on YouTube on installing Windows Powered in VirtualBox. Looks like Windows Powered was indeed an actual Windows 2000 derivative. Even if you look in 2000 pro's NTOSKRNL.exe and msgina.dll you will find a Windows Powered boot screen and login banners. I do think that there are numerous fake ISOs floating around; one YT video has a golden gradient during the third and final startup stage (login) whilst another has the regular blue gradient. It looks like it was also supposed to be designed for PocketPCs. www.pocketpc.com redirects to the Microsoft domain. Well that's something you don't see every day And I meant the T-shirt, not Windows Powered. And yes, Windows Powered actually is an operating system for pocket PCs, payphones, ATM machines, and computer-based appliances. Because when I tested Powered out in VirtualBox, it sort of acted like an embedded OS. Actually there are Windows 2000 and XP shirts in the related items. They're probably more common than legit Windows 7 licences these days. Pocket PCs weren't x86 though, and ran Windows Mobile (which eventually became Windows Phone). Perhaps someone was considering making x86 Pocket PCs? Or a full port of Windows 2000 just like for Alpha and Itanium? Apparently it was for server appliances/web servers/network attached storage; it would have been superseded by Windows Server 2003 for Embedded Systems, Windows Server 2003 Web Edition and Windows Storage Server 2003 I think. I actually believe you on that. Because one time I found a Windows 95 t-shirt on Google Images. But it wasn't a link to eBay, just a picture taken by someone who might have owned one. I'm pretty sure my post saying that Windows Powered works on ATM machines and payphones still stance, because that's pretty much how embedded operating systems work.